The organisation has worked continuously to implement the special Panchayati Raj provisions for Scheduled Tribal Areas as provided for in the Panchayat Extension to Scheduled Areas Act 1996. The Gram Sabhas or village general bodies and especially the women are consequently very powerful and they exercise considerable oversight not only over the Panchayat executive but also over the local officials of the government. One such example is described below. The provisions of the PESA Act make it mandatory for the government to hold Gram Sabha meetings in the villages and take the sanction of the members regarding any development project that is to be initiated in the villages in areas notified as Scheduled Tribal Areas under the Fifth Schedule of the Constitution. Alirajpur district happens to be one such area. There was a proposal hanging fire for quite some time to establish a Wildlife Sanctuary in the Katthivara Reserve Forest in this district. 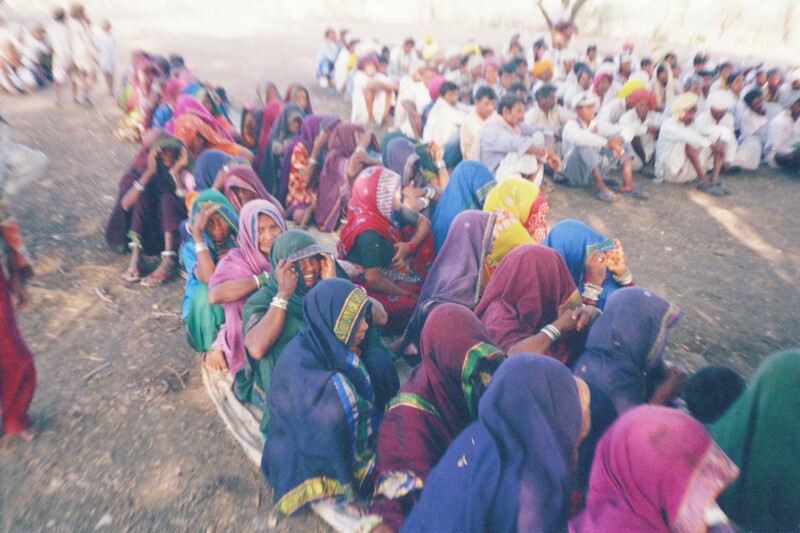 However, during the month of September 2010 when Gram Sabhas were held in the villages that were coming in the proposed sanctuary area the members unanimously rejected the proposal. So now the State Government has declared that the proposed Wildlife Sanctuary will not be set up. This marks a significant victory for the Khedut Mazdoor Chetna Sangath. The story is a long one. It all started with the construction of the Sardar Sarovar dam on the river Narmada in Gujarat. Large areas of forests and along with them the wildlife inhabiting them will be submerged in Madhya Pradesh as a result. So one of the conditions for the environmental clearance given to the project in 1987 was that alternative wildlife habitats in the form of wildlife sanctuaries should be notified. The Narmada Valley Development Authority in Madhya Pradesh put up the proposal for setting up two such sanctuaries in the Mathwad Reserved Forest and the Katthivada Reserved Forest in Alirajpur district. The Wildlife Institute of India (WII) in Dehradun wa s asked to prepare a feasibility report for the setting up of these two sanctuaries. The WII in its report rejected the Mathwad Reserved Forest for having a very high concentration of tribal population and sparse forest area but recommended the setting up of the sanctuary in Katthivara. The Forest Department immediately publicised this in 2007 and said that very soon the state government would notify the area as a Wildlife Sanctuary.Immediately after this the Khedut Mazdoor Chetna Sangath became active. The KMCS activists first visited the affected villages to find out the awareness levels of the people there. While all of them had heard of the proposal and were totally against it they categorically said that so far they had not been officially contacted by any government officials whatsoever. They also said that they had seen some people from outside moving around with the forest guards surveying the flora and fauna in the area but these people too had not conducted any meetings in the village. Thus giving the lie to the WII claim in its report that they had conducted village surveys also and taken the opinion of the people. The first thing that the KMCS activists told the people was that under the provisions of PESA it was necessary to hold Gram Sabhas in each and every village and take their consent before the Wildlife Sanctuary could be notified and land acquisition proceedings begun. The people were taken on a tour of the Bori Wildlife Sanctuary in Hoshangabad district where villagers had been displaced from the core areas and resettled in colonies outside the forest area. The sorry situation of the oustees of the Bori sanctuary in their new habitats where they had not been provided adequate agricultural land and other amenities convinced the people that rehabilitation was not a favourable option. This was confirmed by the generally bad situation of the oustees of the Narmada project also with whom they had a meeting. After this on several occasions the affected people joined with the other members of the KMCS to take part in rallies in Alirajpur and press their demand that the Wildlife Sanctuary should not be established in Katthivara. The representations made to the authorities clearly laid out the legal constraint imposed by PESA that a Gram Sabha had to be conducted first before notifying the establishment of a wild life sanctuary in a Scheduled Area. Finally when the mandatory Gram Sabhas were held the people with one voice rejected the proposal for a sanctuary and so the power of the PESA and the Gram Sabha was proved.